Seaborn J. Collins was born and raised in Georgia. He migrated to Seattle, Washington with his wife Alzada and son William in 1885, where he worked as a mechanic and a carpenter. Collins also invested in local real estate. In 1888 Collins bought property in the Yesler neighborhood, and built a two-story house on the property valued at $1,000. Three years later, the Collins family became the first African Americans to move to the Madison District, a middle class suburban community on the northeastern edge of Seattle. 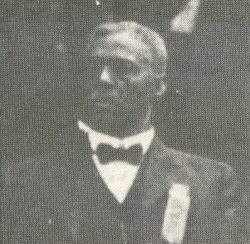 A deeply religious man, Collins was instrumental in developing the Baptist faith in the Seattle area for African American pioneers. In 1886, he gathered the few black children in his neighborhood and organized the area’s first Sunday school. Collins was also one of the trustees for the first Baptist church in Seattle, the Jones Street AME church which later evolved into Mt. Zion Baptist Church. As a church trustee, he helped negotiate the purchase of property off Madison Street and then converted the house on the property into a one and ½ story church. In 1886 Seaborn Collins became a deacon at the church, and he was ordained a minister two years later. By 1900, Collins was the presiding elder at the Jones Street AME church. He continued to pastor churches for the remainder of his life in the Pacific Northwest, preaching at churches in Franklin, Roslyn, Tacoma, and Spokane. Esther Hall Mumford, Seattle’s Black Victorians, 1852-1901 (Seattle: Ananse Press, 1980); Quintard Taylor, The Forging of a Black Community : Seattle’s Central District, from 1870 through the Civil Rights Era (Seattle: University of Washington Press, 1994).